We at The Unique Geek and Need Coffee are doing our planning for Dragon Con 2010 and I am back to help you navigate your way through an even bigger Con. First let me start off by saying this: even though I wrote last year’s survival guide, I seem to have neglected a few of my own notes. One morning I found myself over sleeping from our long night of the Gonzo Film fest, then running to see my good friend interview the fabulous Leonard Nemoy on Sunday morning. Needless to say, I skipped breakfast, and thus setting myself up for a day of feeling like I was running behind. I did manage to grab a salad at Starbucks (of all places). To make matters worse, I forgot my mini snack as well as my water. At least I did not get the dreaded headache. Dragon Con will be adding yet another host hotel this year. It is the Westin. 210 Peachtree Street, which is down the street from the Hyatt. Alternative History and Whedonverse will be in that hotel. Last year, we attendees enjoyed the opening of the Habitrail from the Hilton to the Marriott. This allows a quick stroll between the hotels. This means you will only have to be out in the day-ball to get to the Sheraton and the Westin. Tip: If you are in the parade (you must have a ribbon) a quick way of avoiding people traffic is the head into the Marriott, then up one flight to the Habitrail that leads to the Hilton. Even though the con panels start on Friday, Thursday is a great day to kick off your con experience. Registration opens up at 4 p.m and last year it seems that it opened up a wee bit earlier. Get there early. Thursday is also a great day to meet up with friends you see only at the con. I have been tellng people I know how great Thursday is. You can use the day to go to the High Museum, CocaCola World, and the fabulous Georgia Aquarium. It is a great day to venture up to Altanta’s cool Little Five Point’s. There is an Indian Restaurant that makes a great Mango lassi drink. See last year’s note about Marta on directions to get there. Be sure to use the hotel’s amenities on Thursday. The Hyatt pool gets covered on Thursday, so call your friends if they are in any of the other hotels to get into their pools. It is the day I use the Marriott jacuzzi. I like to hit the spa at the Marriott; it is fantastic. The prices run about the same as any other spa. Check with Marriott for their services and prices. Don’t forget to have dinner and drinks with your friends on Thursday, because, as you know that over the course of the con days texting and squeezing in face time with your friends can be difficult. I have made many new friends on Thursday. The Hacky Sack circle starts Thursday night. I played several card games in the bar in the Hyatt. If this is your first time and you are in Atlanta on Thursday, it is a great time to familiarize yourself with the layouts of the hotels. The Hyatt’s lower levels can get a bit confusing. See you at Dragon Con. 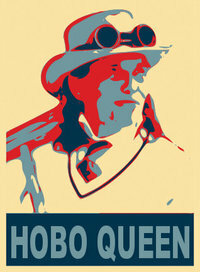 Rox can be found on Twitter, at her blog, and campaigning to be Hobo Queen 2011.